RESURRECTION - Jesus Christ Died! - God Raised Him TO LIFE! 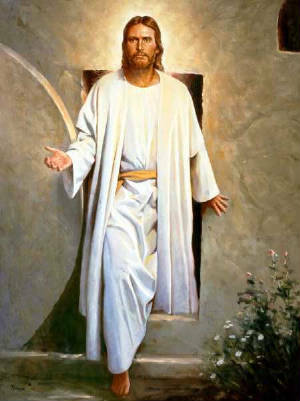 He was buried and he rose again the third day. He was seen by over five hundred brethren at once. The Resurrection of Jesus Christ following his physical death and burial, is among several of the most monumental truths of Christianity. It is also, among the most attacked. The trustworthiness of the Bible, as true and authentic history, is of utmost importance in this regard, since it records the events surrounding Christ's birth, life, death, resurrection and ascension. Below the following paragraph I include an extremely cogent Bible proof from the late Scholar, C.I. Scofield, showing in the strongest possible terms the sure, trustworthiness of the Bible. I do also present scientific evidences, later, as these are crucial too, in confirming the rightness of the Bible. Jesus Christ died. God raised him back to life. This proves God accepted his sacrifice of himself for our sins. He won eternal life for all who believe in/on him. God requires a qualified, innocent-blood, substitutionary, sacrifice, to make payment for sins. All humans are sinners. Sin is measured against God's absolute holiness. Good human works CANNOT pay for sins. It requires an innocent, substitutionary, blood-sacrifice. Good works will, however, earn rewards for those whose sins are properly atoned for. The great scholar, C.I. Scofield sets forth this most powerful, cogent, argument of the divine authorship of the Bible. The Bible is at ONCE, SIXTY-SIX books, and yet truly, ONE BOOK. This is stunning evidence for the divine origin of the Bible. From beginning to end the Bible testifies to one redemption. The Bible has one great theme--the Person and work of Christ. Matthew 22:31-32 But as touching the resurrection of the dead, have ye not read that which was spoken unto you by God, saying, I am the God of Abraham, and the God of Isaac, and the God of Jacob? Luke 20:35-36 But they which shall be accounted worthy to obtain that world, and the resurrection from the dead, neither marry, nor are given in marriage: Neither can they die any more: for they are equal unto the angels; and are the children of God, being the children of the resurrection. John 11:24-26 Martha saith unto him, I know that he shall rise again in the resurrection at the last day. Jesus said unto her, I am the resurrection, and the life: he that believeth in me, though he were dead, yet shall he live: And whosoever liveth and believeth in me shall never die. Believest thou this? Acts 1:22 (Apostle Peter talking) Beginning from the baptism of John, unto that same day that he was taken up from us, must one be ordained to be a witness with us of his resurrection. Acts 2:31 (Apostle Peter talking) He seeing this before spake of the resurrection of Christ, that his soul was not left in hell, neither his flesh did see corruption. Acts 24:15 (Apostle Paul talking) And have hope toward God, which they themselves also allow, that there shall be a resurrection of the dead, both of the just and unjust. Acts 24:21 (Apostle Paul talking) Except it be for this one voice, that I cried standing among them, Touching the resurrection of the dead I am called in question by you this day. 1Corinthians 15: (Apostle Paul talking) Moreover, brethren, I declare unto you the gospel which I preached unto you, which also ye have received, and wherein ye stand; By which also ye are saved, if ye keep in memory what I preached unto you, unless ye have believed in vain. ...But now is Christ risen from the dead, and become the firstfruits of them that slept. For since by man came death, by man came also the resurrection of the dead. For as in Adam all die, even so in Christ shall all be made alive. ...But every man in his own order: Christ the firstfruits; afterward they that are Christ's at his coming. Then cometh the end, when he shall have delivered up the kingdom to God, even the Father; when he shall have put down all rule and all authority and power. For he must reign, till he hath put all enemies under his feet. ...The last enemy that shall be destroyed is death. For he hath put all things under his feet. But when he saith all things are put under him, it is manifest that he is excepted, which did put all things under him. ...But some man will say, How are the dead raised up? and with what body do they come? Thou fool, that which thou sowest is not quickened, except it die: And that which thou sowest, thou sowest not that body that shall be, but bare grain, it may chance of wheat, or of some other grain: But God giveth it a body as it hath pleased him, and to every seed his own body. All flesh is not the same flesh: but there is one kind of flesh of men, another flesh of beasts, another of fishes, and another of birds. There are also celestial bodies, and bodies terrestrial: but the glory of the celestial is one, and the glory of the terrestrial is another. ...And so it is written, The first man Adam was made a living soul; the last Adam was made a quickening spirit. Howbeit that was not first which is spiritual, but that which is natural; and afterward that which is spiritual. The first man is of the earth, earthy; the second man is the Lord from heaven. As is the earthy, such are they also that are earthy: and as is the heavenly, such are they also that are heavenly. And as we have borne the image of the earthy, we shall also bear the image of the heavenly. ...Behold, I shew you a mystery; We shall not all sleep, but we shall all be changed, In a moment, in the twinkling of an eye, at the last trump: for the trumpet shall sound, and the dead shall be raised incorruptible, and we shall be changed. For this corruptible must put on incorruption, and this mortal must put on immortality. ...So when this corruptible shall have put on incorruption, and this mortal shall have put on immortality, then shall be brought to pass the saying that is written, Death is swallowed up in victory. O death, where is thy sting? O grave, where is thy victory? ...Therefore, my beloved brethren, be ye stedfast, unmoveable, always abounding in the work of the Lord, forasmuch as ye know that your labour is not in vain in the Lord. Philippians 3:10,11 (Apostle Paul talking) That I may know him, and the power of his resurrection, and the fellowship of his sufferings, being made conformable unto his death; If by any means I might attain unto the resurrection of the dead. 2 Timothy 2:18 (Apostle Paul talking) Who concerning the truth have erred, saying that the resurrection is past already; and overthrow the faith of some. Hebrews 6:2 (Apostle Paul talking) Of the doctrine of baptisms, and of laying on of hands, and of resurrection of the dead, and of eternal judgment. The forces of evil are very real and very powerful. Our public system ignores God and does everything it can to destroy belief in God and in the Bible. To get everlasting life we must “think outside the (public system) box!” We must determine God's true revelation. It is critical that the Bible match physical evidences. We should use the "jury duty" system and check everything against everything. The following three are very important. 1. This world was specially created. It did not evolve by accident. Close observation with modern tools shows this world to be intricate in the extreme. THIS WHOLE WORLD IS OBVIOUSLY SPECIALLY CREATED. Complex things DON'T MAKE THEMSELVES -- SOME SMART PERSON MUST MAKE THEM. Just think of our own consciousness, the growing process, the healing process, the immune system, the genetic code system, etc., etc. It is easy and natural to compare, side by side, our own humanly made high tech systems, with God's high tech systems in nature. We humans have very great knowledge of both. WE KNOW it takes great intelligence, and determined purposefulness to make such systems. We know that INFORMATION ALWAYS comes from some PERSON'S BRAIN, NEVER FROM ACCIDENTS. IT IS AN ABSOLUTE CERTAINTY THIS IS A SPECIALLY CREATED WORLD!!! 2. This world was destroyed by a great global flood, in which Noah and his family of 8 persons total, were the only humans to survive. THEY CAME FROM NOAH'S FLOOD!!! When organisms die, they ROT or GET EATEN by SCAVENGERS -- THEY DON'T FOSSILISE!!! FOSSILS ARE EXTREMELY RARE. 90%+ of all fossils are MARINE organisms!!! ZILLIONS OF FOSSILS, sedimentary rocks, gas, oil, and coal deposits, bear powerful witness to the global Flood of Noah. 3. The world is relatively young -- less than 10,000 years. Realize that ALL earth or cosmos dating methods are based on unprovable, and questionable ASSUMPTIONS. THERE ARE NO, REPEAT, NO, scientific PROOFS of the age of the earth/cosmos. THEY ARE ALL GUESSES, because the underlying assumptions cannot be proved. However, MOST dating methods favor a young earth, as long as they are not finagled with old-cosmos assumptions, presuppositions, etc. THE BIBLICAL ACCOUNTS OF CREATION, THE FLOOD, AND A YOUNG COSMOS, ARE CONFIRMED BY EVIDENCE. Bible accounts and physical evidence match. We MAY FULLY TRUST the Bible and believe. By God’s grace Noah and his family escaped. Noah's Flood and the Ark with 8 souls on board deliberately picture SALVATION. Believers in Jesus Christ will, likewise, escape God’s final judgment! With Noah's Flood God put us earthlings "ON NOTICE!!!" See my pages -- They Came to Jesus, Seven Powerful Evidences Confirming Special Creation, Why the King James Bible?, Creation and Scripture Must Go Together!